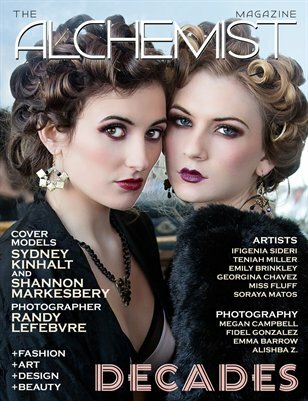 The DECADES Issue of The Alchemist Magazine features models Sydney Kinhalt and Shannon Markesbery on the cover photographed by Randy Lefebvre. The issue also features photography editorials by: Fidel Gonzalez, Emma Barrow, Megan Campbell and Alishba Z. Featured Artists: Georgina Chavez, Ifigenia Sideri, Emily Brinkley, Miss Fluff, Soraya Matos and Teniah Miller.